BACKGROUND AND PURPOSE: Angiographic results are commonly used as a surrogate marker of success of coiling of intracranial aneurysms. Inter- and intraobserver agreement in judging angiographic results remain poorly characterized. Our goal was to offer such an evaluation of a grading scale commonly used to evaluate results of endovascular treatment of aneurysms. MATERIALS AND METHODS: A portfolio of 90 angiographic images from 45 patients selected from the core lab data base of a randomized trial was sent to 12 observers on 2 occasions more than 3 months apart. The variability of a 3-value grading scale used to score angiographic results and of a final judgment regarding the presence of a recurrence was studied using κ statistics. RESULTS: Ten participants responded once and 6 responded twice. Agreement was poor to moderate (κ = 0.28–0.5) for senior and junior observers judging angiographic results immediately or 12–18 months after treatment. Agreement reached a reassuring “substantial” (κ = 0.62) level, with a dichotomous presence-absence of a major recurrence, and intraobserver agreement was better in experienced core lab assessors. CONCLUSIONS: There is an important variability in the assessment of angiographic outcomes of endovascular treatments, rendering comparisons between publications risky, if not invalid. A simple dichotomous judgment can be used as a surrogate outcome in randomized trials designed to assess the value of new endovascular devices. Once we accept that we treat images, we have to define success of treatment in terms of imaging results and costs in terms of increased morbidity at the time of treatment.7–8 This type of comparison is at least awkward, if not invalid, but we will confine the concerns of the present work to the difficulties encountered when we want a verdict regarding success of therapy in terms of imaging results. To use imaging results as end points of clinical trials of new devices, it is paramount that we determine how accurate, repeatable, or precise our measurement tools are. Cloft et al1 showed that agreement between observers evaluating postcoiling angiographic results was better when grading scales had fewer responses, and that substantial to almost-perfect agreement was possible when 2 observers trained and practiced together, using a worse/not worse dichotomous classification. A recent editorial in Radiology called for more stringent evaluation of variability in test interpretations using larger numbers of observers with a broad range of experience.9 Implications for the interpretation of case series in our literature, and for the design of clinical trials, will be discussed. We will also review other grading scales that have been proposed in the endovascular literature. The portfolio was sent twice electronically, at least 3 months apart, to 12 potential participants, all interventional neuroradiologists who work in 6 different centers from 4 different countries (United States, United Kingdom, France, and Canada). There were 6 senior observers (more than 10 years of experience in interventional neuroradiology, including 3 who had previous experience as core lab assessors [2 from the same lab] and 4 junior observers (less than 5 years of experience). There was no training of observers for this task. Apart from the graphic display of the scale, they were not provided with precise definitions of categories. The interrater agreement regarding the angiographic result of the intervention in 3 categories at 2 points in time, and the final judgment regarding the evolution of 2 angiographic results (no, minor, or major recurrence) in the same patient, were measured by the generalized κ statistic.13 All categories, such as “fair,” “moderate,” or “substantial,” were qualified according to Landis and Koch.13 The same approach was used to measure the agreement of senior and junior specialists separately. The variability of the interjudge agreement was studied by calculating κ for each possible evaluator. The intrajudge agreement of the 6 experts who responded twice was also measured by the κ statistic. Because the primary end point of the trial included only major recurrences, agreement was also analyzed in 2 categories (major recurrence, yes or no). All tests were performed with SPSS version 19 (SPSS, Chicago, Illinois). CIs were calculated using 95% CI = κ ± 1.96 standard error of κ. Ten participants responded once, and 6 responded twice, allowing the study of interobserver agreement in 10 participants and intraobserver agreement in 6 participants. Senior observers were not more concordant than junior observers. The intraobserver κ statistic for major recurrence was better for core lab experts (1.0, 0.85, 0.69) than for other evaluators (0.71, 0.65, 0.61). Clinical examples are shown in the Figure. Cases: Selected images showing 1 case with perfect agreement between all observers (complete occlusion; no recurrence; A, B). The case illustrated in C, D showed maximal disagreement for both degree of occlusion and presence of a recurrence. It is commonly agreed that if a lesser morbidity can be achieved with endovascular management, this is accomplished at the price of an increased frequency of incomplete eradication of the lesion at the time of treatment or of recurrences on follow-up imaging studies.2,14⇓–16 Incomplete occlusions and recurrences probably mean an increased risk of future hemorrhagic events,2,14,17 but the magnitude of these risks, compared with those of retreatments, are currently impossible to estimate precisely.17 Imaging results of treatments of aneurysms remain clinically important because many physicians will justify the use of surgical clipping, or of new endovascular devices, on the alleged risks of residual or recurrent lesion with simple platinum coiling. Difficult questions arise when one tackles the problem of agreement regarding a treatment outcome. Some kind of skepticism or relativism is difficult to escape. Surely there must be some reality regarding the presence or absence of a residual or recurrent aneurysm. In the absence of a “gold standard,” however, a truth regarding the verdict of the test seems impossible to capture. In addition, all talks about “prevalence” or “positive cases” must be oblique because these concepts are now relative to a certain observer at a certain time. 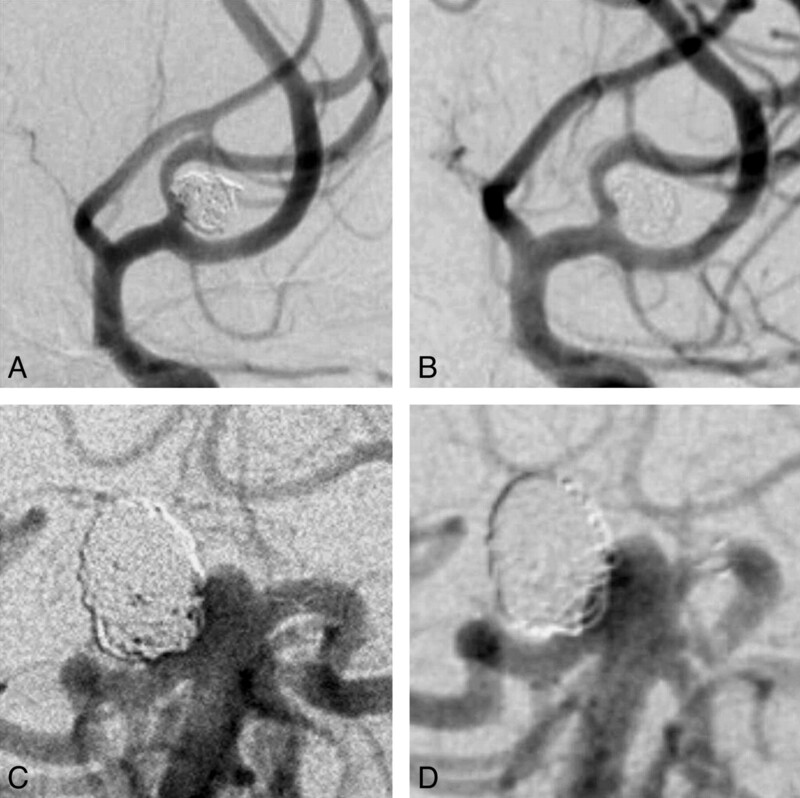 Two types of judgments have been used thus far in assessing results of endovascular coiling: 1) an absolute judgment, a degree of occlusion, reflecting the status of aneurysm occlusion at a particular time, and 2) a comparative judgment, reflecting the “stability of occlusion” in a particular patient. Our aim in the present work was to measure the variability in the interpretation of angiographic images postcoiling of aneurysms using a specific, ordinal grading scale, as well as the variability in the adjudication of a considered important (still nonclinical) outcome, the presence or absence of a recurrence. The present work has shown that agreement regarding an absolute judgment on the “completeness” of angiographic occlusion after coiling is, at best, only fair. Agreement improves to “moderate” with follow-up angiography, but the finding that the prevalence of residual aneurysms can still vary from 20%–60%, depending on the observer, is sufficient to invalidate any attempt at judging the value of different devices by comparing publications of case series performed in different institutions. This disconcerting finding is basically a reminder that RCTs are an absolute necessity if valid comparisons between results of treatments are desired. The present work supports the notion that if angiographic results are to be used as a surrogate end point for clinical success of treatments, a core lab, with experienced observers, is necessary to minimize intraobserver variability. Kappa statistics also show that if anchoring of the judgment scale is difficult with a single time point, variability decreases when a second angiogram is available. Decreasing the number of categories, and judging the evolution between the 2 examinations, further decreases the variability in order to reach an acceptable level of “substantial agreement,”13 as others have previously shown.1 Yet if substantial intra- and interobserver agreement become possible when a core lab judges the value of 2 randomized treatment options within a trial, we must remember that the verdict of the trial is a relative judgment between the 2 options, and absolute results cannot be exported outside the trial itself for comparisons with published series. There are a number of criteria that can be used to assess the value of outcome scales.4 Numerous scales, summarized in the Table, have been proposed in the literature.12,19⇓⇓⇓⇓⇓⇓⇓⇓⇓⇓⇓⇓⇓⇓–34 Some were designed for conventional angiography, others for MRA. If most use a different terminology, or use a numeric or pseudonumeric form, and if some aim to be more “objective” and precise—by multiplying the number of categories—or more intuitive, at least according to some authors, none have been reliably validated.4 Reassuringly, most scales can be translated into the 3-value scale we have previously proposed19 and perhaps, most important, many can be dichotomized to the more reproducible “major recurrence yes-no” judgment. The κ statistic was designed to provide a measure of agreement that takes into account the role of chance in the occurrence of concordant verdicts. The immediate consequence is the appearance of a number of “paradoxes,” previously analyzed in detail by Feinstein and others.10–11 When there is imbalance in the distribution of positive cases within the sample studied, agreement can be expected from chance alone and κ values can be relatively low despite frequent concordance. One way to minimize these paradoxes is to assemble series of cases that include an approximately 50% “prevalence” of the judgment to be adjudicated.10–11 This problem is enlightening, for it reveals the artificial nature of our assessment of concordance. In addition to the number or proportion of “positive cases” that compose the assembly, an even more difficult question arises: What types of cases are to be included? Obviously, some selection, natural or artificial, is going to dramatically influence results. Cases with inadequate follow-up studies, or cases assessed by angiography immediately after treatment but by MRA at follow-up, could not be included in the present study, for example. As for any assessment of diagnostic tests, one is struck by how easy it would be to provide numbers that would only reflect manipulation of cases. Here, as for assessment of accuracy of a diagnostic test, one may propose that the sample must also include a wide variety of “positive cases,” perhaps organized along a certain spectrum of severity, and a variety of “negative cases,” selected among cases that may have pertinence in the clinical context of interest.10,11 In the present work, the inclusion of “unclear” cases has probably increased the difficulty in achieving agreement between observers. We have only provided confidence intervals for κ in On-line Table 4; the variance can become unreliable as sample size decreases or as κ approaches unity, and a bootstrap resampling methodology for each comparison appeared unreasonable.36 A quick glance at the Tables suffices to capture the extent of the variability in concordance between observers. Precision in outcome assessment in clinical trials is affected by 3 main sources of “random error”: observer, subject, and instrument variability. Unless the study is restricted to aneurysms of a certain size or location, or to centers using similar methods and equipment, little can be done to limit subject or instrument variability. Upon reflection, this type of variability is intrinsic to the phenomenon under study, and while it will, by necessity, impose methodologic adjustments, such as increasing the number of patients to be recruited in the study to show a difference between 2 groups, any restriction designed to artificially increase precision will impact on the validity of the results. Ten of 12 potential observers responded once and only 6 responded twice. While we can only speculate what the results would have been had missing responses been available for inclusion, this problem also raises the issue of how artificial this type of assessment is. How seriously observers worked to come to verdicts can always be questioned, and the context of assessment is certainly different from a typical clinical or core lab context. The variability we observed in judging the extent of angiographic occlusion of treated aneurysms, and the presence of a recurrence at follow-up, was probably underestimated by the method we chose because there are many other sources of discrepancies in a core lab context: There are more images, from various series, using various projections and diverse equipment from various centers throughout the world. Legitimate strategies to enhance precision include standardization of angiographic projections and techniques, using an operations manual, refining criteria defining the score classes, and training (and sometimes certifying) the observers. A final note on a compounding factor that will affect future trials and that can multiply the difficulties in minimizing variability is the increasing use of various noninvasive imaging strategies, often imposing a comparison between different imaging modalities at different time points in the same patient, a problem that was evaded in the present work.37 Needless to say, the results we present only apply to patients followed by conventional angiography. It is unclear what to do if patients are to be followed by MR angiography. Perhaps this experience, along with that of others,1 suggests that if we are to start all over with grading results according to noninvasive imaging, a simple classification scheme (presence or absence of a large residuum; presence of absence of a major recurrence) would be the most reproducible. Agreement between observers adjudicating angiographic results of coiling is moderate at best. “Substantial” agreement, using a dichotomous verdict regarding the presence or absence of a major recurrence, through using 2 different angiographic studies, can be reached by an experienced core lab within the context of a randomized trial. Disclosures: François Guilbert—UNRELATED: Expert Testimony/Grants/Grants Pending: FRSQ, Comments: Fonds de Recherche en Santé du Québec; $150,000 for study on MR imaging of nonlesional epilepsy. Guylaine Gevry—UNRELATED: Employment: Employee of Dr. Raymond. Jean Raymond—UNRELATED: Grants/Grants Pending: MicroVention, Comments: Unrestricted research grant for the PRET Study.
. Endovascular treatment of acutely ruptured aneurysms of the basilar bifurcation. J. Neurosurg 1997;86:211–19. Accepted after revision July 15, 2011. Point--TAR: A Useful Index to Follow-Up Coiled Intracranial Aneurysms?